Chickens dream just like we do. They experience REM (rapid eye movement) during sleep. 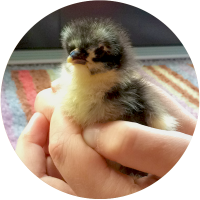 When I first made the decision to keep hens, I realised that there’s a fair amount of preparation required and I know for some beginners, it’s difficult knowing where to start. It can be difficult sourcing chooks but they can be bought from breeders, local keepers and farms. You need to know what to look for when choosing a chicken. Even though chickens are low maintenance compared to pets in general, there are a number of things you need to consider before taking that big step to hen keeping. Depending on where you plan on keeping your chickens, whether in your back garden or on an allotment, there are a variety of shelters to choose from. There are a variety of foods to give your chickens. Here’s some information on the different types of chicken feed and what other supplements and treats you can give them. Although chickens are relatively inexpensive to keep, there are items you’ll need to purchase and have to hand prior to getting your new additions.